A period estate that dates back almost 100 years, Taylors Hill was owned by a British planter the traces of which are still pretty relevant in this unique architectural marvel. A sense of nostalgia, utmost luxurious, and definite comfort are some of the key takeaways from the estate. Found in the Sri Lankan countryside near the city of Kandy, the estate is an idyllic location for travellers looking for a respite and some quiet time away. It is suitable for large parties as there are five bedrooms, acres of lush gardens, and plenty amenities. 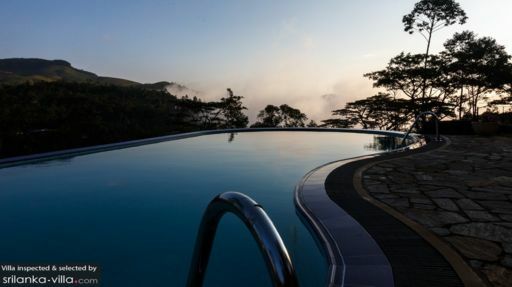 An infinity swimming pool overlooking the splendid sunset will be the cherry on top. Five bedrooms namely Pattiyagama, Loolecondera, Taylor, Le Cocq and Lipton promise absolute comfort, luxury, and a soothing ambiance. Designed with additional care ensuring each room is unique with its personal aesthetic, the bedrooms feature walls that are painted with dandelions, bed posts shaped as trees, gold-finish four-poster beds with drapes, quality bedding, a rich colour palette. Pattiyagama stands out from the rest with its personal sitting area and open fireplace for a cosy ambiance. 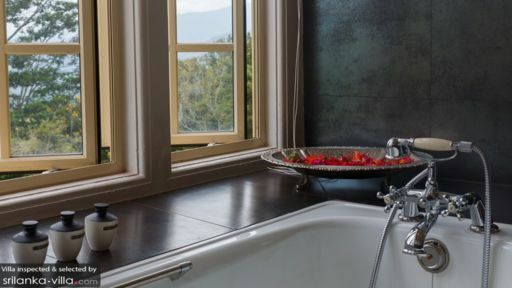 Each of these five bedrooms has an en-suite bathroom with lavish bathtubs that come with elegant fittings, dual basins, ornate interiors, and large windows overlooking the stunning cliff-side view. Sprawling gardens sit all around the estate with abundant flora that thrives in the tropical weather. The clouds hover out front for a picturesque vista that you can enjoy while relaxing in the free-size infinity swimming pool. The pool deck is furnished with sun chairs for sunbathing and resting in-between dips. The hills are visible from the estate which will make you feel like you’re in another world altogether. Guests can truly relish their time here as activities include tennis, badminton, and croquet. Taking you back in time is the living area at Taylor Hill with a classic chandelier, a stone fireplace with wooden logs, plush sofas, and chaise, and large windows. The hardwood flooring shines under the bright lights for a more opulent and luxe vibe. A few drinks in the evenings when the sun sets with loved ones is the best way to enjoy the serenity and calm that engulfs this region. There are antique and timeless pieces decorating the corners of the living area to bring it back to life. The walls are papered in a truly vintage manner and yet hints of Sri Lanka peek through. The cosy living area is not the only comfortable space at the estate, you also have the media room with uber comfortable seating, a massive flat-screen, walls adorned with framed movie posters, and you also have the games room with a billiards table. Enjoy deliciously-cooked meals in the opulent dining area that speaks volumes of the estate’s past. Enough seating for all makes it even more enjoyable for guests. There are so many things you can do at the estate itself including the games and media room, outdoor activities, etc. The staff will serve you with utmost humility and hospitality to make you feel at home so much so you wouldn’t want to leave. 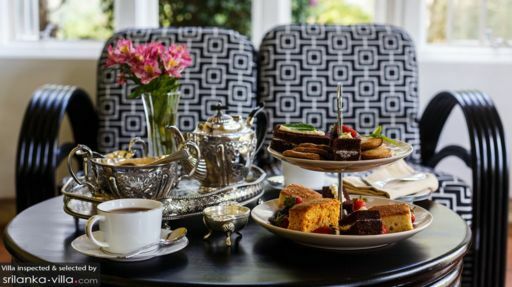 From a three-course breakfast, high tea, to a mouth-watering dinner, you can request for each and every meal to be served (cost extra). Day-trips around the estate to nearby nature trails, national parks, and the city of Kandy can be arranged quite easily so you can enjoy your time here. There is wildlife waiting to be explored and you can even visit an elephant nursery for a closer look. Tea plantations and factories are another sight you don’t want to miss out on. Beautiful rooms overlooking amazing gardens and grounds in a beautifully restored house.the siiting rooms were great and the enormous snooker table was well utilized. The staff are friendly and efficient and the food was great. The house is located in a lovely rural setting perfect for relaxing with activities on offer like tennis croquet and badmitton. The pool is in need of updating but is adequate wiill lovely views .Overall a fantastic place to relax in a beautiful setting with great staff and food. I cannot recommend Taylor’s Hill highly enough – without a doubt my favourite hotel I have ever stayed in! I spent two nights there in September 2015 with a friend in the beautiful ‘Taylor’ room. Taylor’s Hill is a beautiful colonial house with immaculate gardens and wonderfully decorated interior – SUCH a nice atmosphere overall. We were very lucky in that we happened to be the only guests in the hotel for the majority of our stay and the service was exceptional – but I don’t doubt that it would have been just as good had the hotel been full! Dawn was lovely – welcoming, and very helpful with her recommendations of things to do during our stay. All of the staff were incredibly friendly and attentive. And the FOOD! We couldn’t believe how delicious absolutely everything was! It could rival most London restaurants. Even though we were the only guests there were several choices for each course at every meal and every single thing we ate was spot on. The freshest fruit salads and smoothies, amazing full English breakfast, afternoon tea with homemade cakes and sandwiches, exquisite soups, curries and desserts… the best food we had in the whole of Sri Lanka. Apart from lounging around in the beautiful living room or morning room or gardens, there is also a TV room, snooker table, pool, croquet lawn and badminton net – we mentioned one night that we might play croquet and badminton the next morning and by the time we had finished breakfast outside in the sun they had already got all the equipment out for us! We also did a day trip to an elephant orphanage (a couple of hours’ drive away) and to Kandy. Honestly, this place is faultless. I can't think of a single thing it could improve. I would go back to Sri Lanka just to stay at Taylor’s Hill again. We were so sad to leave - it felt like home after just two days! Thank you for a fabulous stay!! This is a superb boutique hotel with great rooms, delicious food, excellent service and beautiful, quiet surroundings. Our stay could not have been better. From the moment we saw the gardens and walked in we knew that this was quite different from all the other places we stayed in in Sri Lanka. Every detail is just right in this very spacious grand country house,which is kept to a very high standard. Decoration is tasteful but not staid, everything is in very good condition and the staff are very attentive without being in any way overwhelming - just the right balance to make you feel as if the place is yours. We stayed 4 days, but I would have preferred to stay for 4 months. We loved our night's stay at Taylor's hill, the staff were friendly and attentive, and the food was excellent. The room and location were brilliant too. It was great to get a taste of the lifestyle enjoyed by the colonial classes and later the Sri-Lankan elite. It felt slightly weird to us enjoying what must have been a very bi-polar time in life for those around then! Unique, exceptional property situated amongst tea plantations. This is the old house of James Taylor, the father of tea-growing in Sri Lanka. The owners have really succeeded in keeping some of the old, colonial charm and blending it with a more modern approach. You almost feel like you are part of a Poirot episode, playing croquet and sipping afternoon tea in the garden. Everything, the rooms, the beautiful garden, the pool, the tennis field, as well as the staff, is great. Also, the food is really good, and you even have the opportunity to participate in a Sri Lankan cooking class! The service is exceptional, and you always feel very welcome. Nothing is a problem. Highly recommended!!! Don't expect an easy drive to this wonderful hotel. It is hidden between tea plantations and can be reached after an exciting 75 minutes ride from Kandy. However, on your way you will see nice little villages, local communities outside crowded tourist areas and you will get a sense of the real life in Sri Lanka. The hotel is a gem. We had a beautifully decorated suite with a nice view. The restaurant and lounge areas are charming. The quality of service was personal, authentic and absolutely perfect. We felt like being in our own home from the beginning. We were surprised about the excellent quality of the food, something you do not expect in such a remote location. We highly recommend to visit the tea factory and tea plantations close to the hotel. If you need a rest from your visit to the cultural triangle, choose this place. You can completely relax for a few days and continue your tour re-energized.